A proposal seeking to separate the role of chairman and CEO at the social media giant performed well among investors. A large minority of outside investors voted to have Facebook (FB - Get Report) separate its chairman and CEO roles, which are occupied by Mark Zuckerberg, the social media company's founder. Specifically, 31% of shares not owned by Zuckerberg voted to back a shareholder proposal seeking to have the two roles separated, according to a securities filing released by Facebook Tuesday. The shareholder proposal is non-binding, which means Facebook is under no obligation to change its governance structure in response to any investor opposition. Nevertheless, the measure, which was introduced by SumOfUS, an investor group dedicated to checking the power of corporations, shows that a large group of investors aren't happy with Zuckerberg controlling both roles. Governance experts and institutional investors prefer that companies have independent board chairs because they provide critical oversight of executive decisions. "There is a clear conflict of interest when a corporation's board of directors, which is responsible for overseeing the CEO and representing shareholders, is chaired by that same CEO," said SumOfUS adviser Lisa Lindsay in a statement. "Today, Facebook's independent shareholders sent a clear signal that an independent board chair is a necessary first step to put Facebook's board on the path to effective representation of the interests of all shareholders." The activist fund's campaign was likely bolstered by frustration among retail and institutional investors that Facebook doesn't have a one-share-one-vote structure. Facebook, like a number of the biggest tech IPOs, was structured at the outset with a dual class voting system that gives Zuckerberg control of the business that is disproportionate to his economic interest. Mark Zuckerberg speaks at Harvard. A separate investor proposal seeking to adopt a recapitalization plan so that all shares have one-vote per share received about 51% of the non-insider vote, a clear mandate for change. The proposal noted that Zuckerberg controls Facebook with over 52% of the vote even though he only owns 14.36% economic value of the shares. As a result, minority investors have no ability to vote in new directors or have a meaningful impact on the board if they are dissatisfied. Editor's note: This article originally published at 6 pm ET on June 6. Nevertheless, the vote is unlikely to drive Facebook to separate the two roles. The social media giant argues that Zuckerberg is the visionary founder of the company, which has appreciated significantly in share-price value under his watch. In addition, the company points out that it has a lead independent director, Susan Desmond-Hellmann, the chancellor of University of California, San Francisco, who serves as a liaison between Zuckerberg and the independent directors. "Forcing a division between our chairman and our CEO could harm our performance and be detrimental to interests of our stockholders," Facebook said. 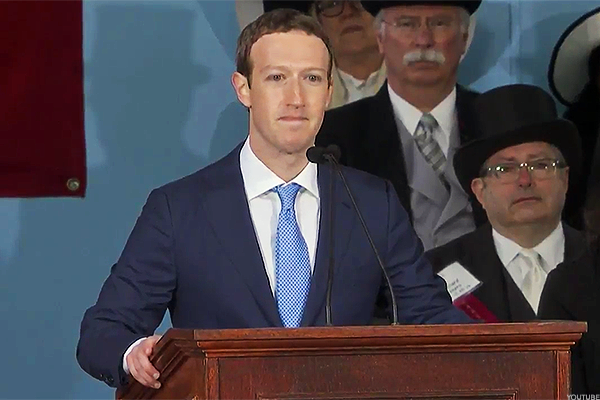 "Mr. Zuckerberg, as our founder, has guided us from inception and is invested in our success."